This standard describes a procedure for determining shop or field conformance to a specified coating dry film thickness (DFT) range on ferrous and non-ferrous metal substrates using nondestructive coating thickness gages (magnetic and electronic) described in ASTM D 7091. The procedures for adjustment and measurement acquisition for two types of gages: "magnetic pull-off" (Type 1) and "electronic" (Type 2) are described in ASTM D 7091. 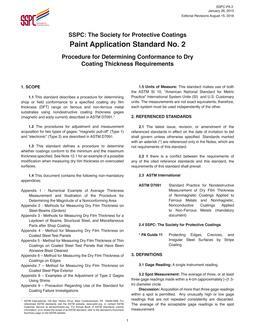 This standard defines a procedure to determine whether dry coatings conform to the minimum and the maximum thickness specified. See Note 11.1 for an example of a possible modification when measuring dry film thickness on overcoated surfaces. This document is not intended to prescribe a frequency of coating thickness measurement for a coating failure investigation.